IntelliJet Marine, Inc. will present a paper on propulsion and computer simulation for sustainable high speed boats and ships at ASNE Day 2015. Jeff Jordan of IntelliJet Marine will present a paper on propulsion and computer simulation for sustainable high speed boats and ships at the American Society of Naval Engineers’ ASNE Day 2015 on March 5, 2015 in Arlington, Va. According to IntelliJet, the military prefers jet boats but struggles with their fuel efficiency. Valued for their high speed capability and shallow draft, marine jet drives dominate propellers in military and commercial craft even though jets consume more fuel at lower speeds, where many spend most of their time. 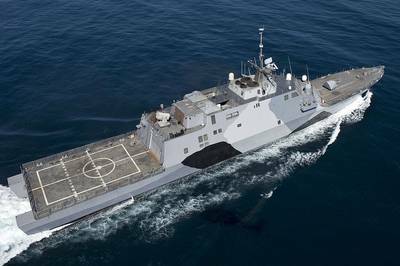 The new Littoral Combat Ship Program 7th Fleet suggests the Littoral Combat Ships, particularly LCS-1, would be more suitable for service in a smaller ocean, where it is not so far between fueling points, according to this quote from US Government Accountability Office report GAO-14-749, Jul 30, 2014. By incorporating technology that has improved modern aircraft and cars, marine jet craft can optimize fuel efficiency at low and mid-range speeds without sacrificing high-speed capability, IntelliJet said. IntelliJet Marine explained that it continues to refine its technology to meet the worldwide need for sustainability, providing a cleantech system that works with various hulls and motors to achieve high total system efficiency, lower emissions and fuel savings.